For the 50th Anniversary celebrations of BNT Past President Sonja Kinnersly compiled a history of the company. She has prepared a summary of this history. This history is followed by a brief look forward to the following 25 years. A detailed history of these years will follow shortly. “Theatre Movement - Ballarat Branch"
Ballarat enhanced its cultural reputation last evening when an enthusiastic assemblage of over 100 people unanimously passed a resolution to form a branch of the National Theatre movement. “That this meeting of citizens of Ballarat affirms the desirability of forming a branch of the National Theatre movement in this city”. The Bishop said that he did not wish to start an argument, but it was “very serious indeed that the Ballarat public had to content themselves with moving pictures and did not have the opportunity of witnessing opera and drama”. The motion was seconded by the Rev H P Fewtrell and carried unanimously”. In 1988 I wrote in my book Ballarat National Theatre – Fifty Golden Years that this article had marked the beginning of the fifty-year history of Ballarat National Theatre. The inaugural meeting of the National Theatre Movement, Ballarat Branch had heard how Ms Gertrude Johnson had founded the National Theatre Movement in Melbourne two years previously. The Ballarat branch was the first established outside the metropolitan area, and is the only one of several regional branches which is still operating. Miss Johnson, an opera singer of international renown, and inspired by the work done at the “Old Vic” in London had initiated the National Theatre Movement for the purpose of establishing a national theatre in Australia. This was to include a children’s theatre, and to make the movement the home of drama, music and dancing. In addition the movement sought to assist Australian artists, writers and composers, and to produce the best possible entertainment at moderate prices. The late Mrs Jenny Strickland, then Miss Jenny Parkinson, was the first organiser of the branch, and it was mainly due to her energy and interest that the movement became firmly established in Ballarat. Monthly meetings were held at the Wattle, where a small stage was available, and the branch installed front and proscenium curtains. At the monthly meetings readings of three-act plays were given, to the great enjoyment of members. decide as appropriate” (meeting minutes 12 December 1938). One of the branch’s early successes was A A Milne’s Mr Pim Passes By with J Beresford Fowler as director. This was presented in the Plaza Theatre Ballarat for a two-night season in 1940, and later staged at the Horsham Town Hall. These two seasons raised a considerable sum of money for patriotic funds, namely the Red Cross and the Australian Comforts Fund. In December the popular farce Take My Advice was staged again at the Plaza Theatre and in Horsham, as well as other country towns in the district. 1940 proved to be a most successful year for the Ballarat branch and at the annual meeting in 1941, it was reported that a sum of 193 pounds had been raised for patriotic funds. In addition to the two major productions numbers of smaller works were presented in Ballarat and several towns in the area. Berkley Square was the most notable production of 1941 in addition to numerous one-act plays and play-readings, however due to war conditions the branch was unable to repeat its large-scale activities of the previous year. As a reflection of the times a one-act play World Without Men was taken to various camps to entertain the troops. 1944 saw a marked revival in activities, and members enlivened their meetings by play-readings, and some entertaining programmes were provided for the men of the services in the hospital and convalescent homes. In the early years of its history the Ballarat branch of the National Theatre movement was fortunate in having the services of several notable directors, and productions were reported as being of an excellent standard. The latter years of the war saw a renewal of enthusiasm in the branch’s members and in 1944 The Late Christopher Bean was produced and performed at the Plaza Theatre in aid of the then Benevolent Home (now Queen Elizabeth Centre). Later in that year Woman Bites Dog was staged at the Plaza. 1945 proved to be the branch’s most successful year to date with three major productions – J B Priesley’s Dangerous Corner, Night Must Fall by Emlyn Williams, staged at the Trades Hall and George and Margaret by Gerald Savery produced at the Alfred Hall. Also in 1945 the National Theatre Movement Melbourne brought the production of Terence Rattigan’s French Without Tears to Ballarat where it was staged at the Alfred Hall. 1946 was another busy year for members, and again three major productions were presented. These were Gaslight, presented at the Alfred Hall, Jane Steps Out by comedy writer Kenneth Horne and Rebecca, which, the following year took out first prize at the National Theatre Movement Drama Festival in Melbourne. It is noted that Jane Steps Out, a comedy, which delighted audiences nevertheless offended the moral sensibilities of Archdeacon Morgan-Payler, the branch’s president of six years, and he tendered his resignation which “was received with regret”. In 1947 Rookery Nook a comedy by Ben Travers was produced at the Alfred Hall, Claudia at the Trades Hall and The Crime at Blossoms again at the Alfred Hall. A fourth production Victoria Regina was also staged at the Alfred Hall. In 1947 also the NTM Melbourne brought its production of The Merchant of Venice to Ballarat where it played at the Alfred Hall. Two of the Ballarat branch’s inaugural members were at that time among its most active directors – Miss Thelma Morton and Mrs Jenny Strickland. In 1948 Jenny Strickland produced the Australian premiere of Duet for Two Hands by Mary Hayley Bell, wife of actor John Mills. The Ballarat season was staged at Her Majesty’s Theatre in May, and in July it was taken to Melbourne where it played at the National Theatre, to rave notices. The principal role of Duet was taken by the late Phil Hobson, a much-loved Ballarat actor and singer. Three more productions completed the 1948 season – Ivor Novello’s Full House, J B Priestley’s I Have Been Here Before (both productions directed by members Geoff and Elaine Richards) and Lady Precious Stream by S I Hsiung, with direction by Hal Porter, who also constructed the elaborate head-gear worn in the production. The Ballarat Courier (30 November 1948), notes that “Bob Lemke gave a good performance as the condemned General Wei”. Ballarat branch was again successful in the National Theatre Movement’s annual drama festival, taking out second prize with I Have Been Here Before”. One of the greatest handicaps the branch had to overcome was the absence of a suitable hall for either rehearsals or performances. Following the period where the Wattle was its centre, the branch found an “excellent room” at the Returned Soldiers’ Institute. Later three different venues were used – the City Hall, Christ Church Cathedral hall, and Miss Frizzelle’s dance studio rooms in the Mechanics Institute. It was to be June 1949 before the branch found its first permanent home in what was termed the Theatrette in Camp Street. For many years this was known affectionately to Ballarat audiences as the “Little Theatre” and it was indeed little, holding only 100 patrons at full stretch. At the official opening of the Little Theatre the Mayor Cr F C Wray commended the Ballarat National Theatre movement for giving real public service. “I clearly recollect the wonderful job the branch did during the war. It raised several hundreds of pounds for welfare funds as well as entertaining troops in camps. This was meritorious service for which the city is grateful, and I hope this will be the beginning of many fine performances. I ask that this movement be given the assistance of Ballarat people, including financial help” (Ballarat Courier 9 June 1949). The Little Theatre was Ballarat’s first and only intimate theatre. Sadly, it closed in 1984, and the group again had to find new premises. The first production in the new theatrette was G B Shaw’s Candida directed by Austin McCallum. Earlier that year A Quiet Weekend by Esther McCracken was produced at the Alfred Hall. The noted British director Tyrone Guthrie had attended a rehearsal of the production as the guest of the then Premier T T Hollway. Between scenes he told a Courier reporter “I think the amateurs are doing a fine job of work in Australia, keeping the theatre alive, arousing interest, and so on” (Ballarat Courier 28 March 1949). Following the staging of Candida in June, Jenny Strickland presented her production of Therese Raquin by Emile Zola. This excellent production won first prize in the NTM Drama Festival and Peter James was pronounced Best Actor. The production also won unstinting praise from the Melbourne press. In November of that year Geoff and Elaine Richards produced Truant in the Park. Also in November, audiences enjoyed scenes from Macbeth produced by John Alexander Scott who later went on to fame as a stage and television actor in Britain, and who returned to the Melbourne stage for a season with the Melbourne Theatre Company in the early 1980s. In April of 1950 Dr Angelus by James Bridie was produced by Austin McCallum, and in July, Austin won a competition for playwrights under the auspice of the NTM Ballarat branch. This competition attracted entries from all Australian states and New Zealand. Austin’s winning entry was based on his experiences as a prisoner of war and was entitled When Grief Hath Mates, a quotation from Shakespeare’s King Lear. Third prize in the competition was won by Mary Hewitt of Maryborough for her play One Afternoon, which was produced by the branch later in the year. Proceeds from performances of both productions went to the Ex-POW’s Association. In July Ibsen’s A Doll’s House was staged. Later that year Geoff Richards’ production of Fumed Oak by Noel Coward was successful at the Royal South Street Competitions, in the One-Act play section. In April 1951 Written for a Lady by Leo Marks was produced by Jenny Strickland who was again successful in carrying off first prize the NTM Drama Festival. July saw the production of Great Day by Lesley Storm. For this production a professional director Mrs Veranne Irving was engaged at a fee of fifty five guineas, plus expenses. An account from Craig’s Royal Hotel show that these totalled twenty four pounds, sixteen shillings and one penny. Her room cost one pound one and sixpence per night, telephone calls amounted to around eleven shillings, and on 24 July it was recorded that two dinners had cost thirteen shillings. In September 1951 Wasn’t it Odd? By Kenneth Horne was presented at the Alfred Hall for the Gold Centenary in conjunction with the 2nd Annual Rotary Conference. This performance was attended by 700 people, and it is recorded in the minutes that “in appreciation of the efforts of the Ballarat Orchestra with the play, a donation of five guineas be made to the orchestra”. 1952 Saw productions of The Late Edwina Black and the work of a local writer Mrs Elvie Williams, The Vengeance. In November that year The Shining Hour was produced; this marked the directing debut of Miss Pam Skinner. That year also the committee had adopted a plan of sponsoring productions by other local drama groups, and these included Rope by the Theatre Guild, The Chiltern Hundreds a production of the Yarrandoo Players, and in June Mr G F J Dart’s group performed My Last Duchess. During 1952 also Miss Maureen Christie initiated a Shakespeare study group. In 1953 Mr Ron Quinn was appointed as the branch’s full-time producer. The writer Hal Porter, who had taught for a period in Ballarat, was one of the unsuccessful applicants. He had written to Geoff Richards (Secretary) “...if therefore, you have a space for me to do a production for you I’d be delighted. I would not at the moment be able to do it for nix...but out of affection, I would certainly do something for no more than is required to prevent me sleeping in the Ballarat Public Gardens”. With Ron Quinn as full-time producer it was planned that seven full-scale productions would be presented, however in the event this proved impossible and five productions were mounted. These were Enduring as the Camphor Tree, Outward Bound, The Happiest Days of Your Life, Ladies in Retirement, and Exercise Bowler, an experimental work in fourteen scenes. In 1953 Royalty fees paid for plays were around three guineas per performance and patrons paid four shillings for a seat at any play that season. In 1954 the branch joined the newly-formed Victorian Drama League for a subscription of two guineas. In 1954 also, it was decided that an honorarium of ten guineas be paid to the producers (directors) of all plays which ran for the full six-night season, plus out-of-pocket expenses of up to ten guineas. As ten guineas in 1954 was roughly equivalent to a week’s pay, this was considered to be generous remuneration. At the Annual Meeting in March, the one-act play At Dusk was presented, and this was to later achieve success at drama festivals in Camperdown and Maryborough. In April, an Australian play Fountains Beyond was staged and in August An Inspector Calls was produced, and by special request was later performed in Miners Rest and Colac for charity. The final production of the year Young Wives’ Tale was also staged the following March, when two performances netted nine guineas for the Begonia Festival. The first major production for 1955 was The Third Visitor in May, and in September The First Mrs Fraser, a sophisticated comedy which later gained second place in the South Street play competitions. Members also enjoyed rehearsed play readings, in April The Dark is Light Enough, in June The Fire on the Snow, and in August several readings arranged by Mrs Gwen Heinz. Improvements were constantly being made to the theatre, and in May the committee acknowledged the generous donation of curtains by Mr George Lemke. The 1956 season opened with a production of Antigone by Jean Anouilh. This was followed by Mrs Anne Nott’s production of No Monument for Mark by Kate Lindsay. Later in the year September Tide by Daphne Du Maurier played to excellent houses. At the June meeting Mrs Harold Holt entertained members with an amusing talk ‘The Theatre in England and Abroad’, detailing her experiences both in England and Hollywood. In terms of fund-raising for various charities, in 1956 Clunes Hospital, the Base Hospital Centenary Radio Appeal and the Dramatic Art section of the South Street Competitions all benefited from donation by the NTM Ballarat branch. The group was also in demand for its contribution to Ballarat’s various artistic activities. At the opening concerts at the new Civic Hall the group had staged an excerpt from Heaven and Earth. In October White Queen, Red Queen was successful in gaining second place in the one act play section of the South Street Competitions. In April of 1957 the production of the Alan Melville comedy Castle in the Air was staged at the Civic Hall for the Apex Convention. July saw the Eric McGrath’s production of After My Fashion which played to capacity audiences. In December a special Christmas review was staged - John Fox’s production of Infra Dig. The original scripts were written by Jan and John Fox, and Mary Barling. John Fox later was to go on to a successful career with ABC television. The show proved to be very popular with audiences and paid off well at the box office, making a profit of 100 pounds for the six-night season. In 1957 the committee initiated the principle which has carried through to the present day, that of circulating a newsletter periodically to members. Another innovation, which delighted members, was to have impromptu play-readings at members’ nights. In 1958 Jenny Strickland produced the one-act play The Unknown Hand for the Begonia Festival Drama season, and Pam Skinner presented the melodrama Madam Tic Tac which later played to packed houses at the Little Theatre. In June Sheridan’s delightful play The Rivals, was performed, with direction by John Fox. A total of 260 school children saw the play and were able to experience the text brought vividly to life. The play was both an artistic success and a financial one with 125 pounds being made. In all 1000 people saw the play over a ten-night season, with extra seats being brought in to cater for the crowd. There were further successes for the group with Dark Brown gaining a prize at South Street, and in October Kira Mather produced Theme Song, which had been a prize-winner in the South Street play-writing competition. The first play for the 1959 season was Noel Coward’s ever-popular Private Lives which played to full houses. The March production Dial M for Murder enjoyed a successful season at the Little Theatre but was also staged at Langi Kal Kal, Beaufort, Buninyong, the Mental Hospital, and was National Theatre’s contribution at the Begonia Festival. The July production The Heiress also played to full houses and there were requests to tour this production to many country centres. The year’s fourth production was John Fox’s Look Back in Anger by John Osbourne. This play represented some risk-taking on the part of the committee given John Osbourne as the first of the ‘angry young’ playwrights, was not every patron’s ‘cup of tea’. In the event the production won unstinting praise from audiences. 1959 also introduced the advent of the One-Act Play Festival, in which three plays were presented in one evening. The opening night of the festival was attended by the founder of the National Theatre Movement Miss Gertrude Johnson. The December production was Who is Sylvia, directed by Pam Skinner. parody That Summer of the 777th Billy-can by Mr G F J Dart (headmaster of the Boys’ Grammar School) being produced for the delight of members. In March 1961 The Moon is Blue was presented by Kath Torney. This was popular with audiences and ran for two extra performances. In June Agatha Christie’s The Hollow was staged, with production by Joy Smith, a newcomer to the group. In August, after an absence of nearly two years, John Fox returned to produce The Dark of the Moon, which was the biggest and most successful play to be staged in the Little Theatre to that date. It played a total of eleven performances and the theatre was packed to capacity on each night. The play had a cast of 22 and a total of 1250 people attended the production. The final production for the year was a review, titled Who Said That? which was produced by Kira Mather and Bill Reynolds and proved to be an excellent pre-Christmas presentation. Members’ nights continued to be enlivened by play-readings and guest speakers. During the year two radio plays were presented on 3BA – Martin Dudley and Music at Dusk. Ballarat Film Society made its home in the Little Theatre in 1961, where it continued for some years. A season of one-act plays opened 1962. The plays presented were Flashback, The Ugly Duckling, and Temptation Sordid. In May a production of Hamlet was staged, with Ron Boon in the title role. The play ran for a season of twelve performances extending over a period of four weeks. Portions of the play were televised for BTV6. The final production for the year was Come Back Little Sheba directed by Pam Skinner. At the Annual Meeting in October Miss Connie Russo as President had said that on this occasion, the twenty-fifth annual meeting, the theatre could be proud of its achievements, not the least of which were the seventy full-scale productions staged since the theatre’s inception in 1938. 1963 was another busy year, with the staging of four full-scale productions. In March Connie Russo’s production of Bell, Book and Candle was staged for the Begonia Festival. Audiences were good and a record profit of 186 pounds was made. 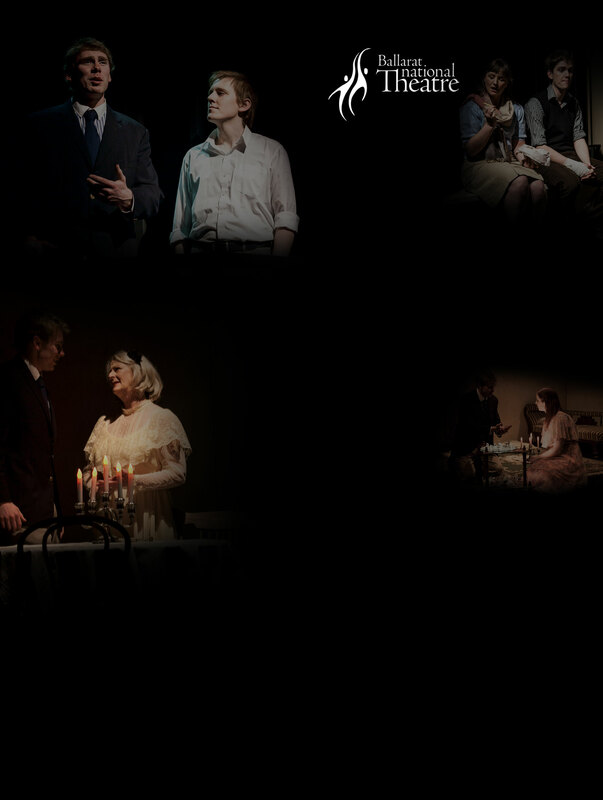 The next production was the Tennessee Williams classic The Glass Menagerie, and this was followed in October by Joy Smith’s production of The Chiltern Hundreds. This production saw the welcome return to the NT stage of Marj Ford and Bob Baker, both beloved of Ballarat audiences. In December another review was staged, With Knobs On. This bright production, as with the previous reviews proved to be very well received by the pre-Christmas audiences. Noel Coward’s Blithe Spirit opened the 1964 season, and it was noted that on the opening night the Red Cross had managed to sell “more than a house full of tickets”. technician. The final production for the year was Peter Ustinoff’s Romanoff and Juliet directed by John Stapp. 1965 saw a record number of plays produced – six in all. The first was Jenny Strickland’s production of Night Must Fall, which had previously been produced by Jenny in 1945. The next production was Shakespeare’s The Taming of the Shrew, and this was followed by Ron Boon’s production of Hot Summer Night, The Little Hut and the Moss Hart and George S Kaufman comedy You Can’t Take it With You. The final production for the season was Sandy Wilson’s light-hearted musical set in the 1920s The Boy Friend. This was staged at a cost of 150 pounds, considered to be ‘big budget’ in 1965. To offset these high production costs admission prices were increased to ten shillings for adults, eight shillings for members and six shillings for concessions. That year the theatre also entered a float into the Begonia Festival parade; this featured scenes from The Taming of the Shrew. The float won first prize and was seen as excellent publicity for the production. The prize was a handsome silver teapot, which featured on-stage in the production. The first production for 1966 was The Queen and the Rebels, and this was followed by the George Bernard Shaw favourite Pygmalion directed by Alan Wakeling. As Black as She’s Painted with production by Jenny Strickland followed, and T S Eliot’s The Cocktail Party completed the season. Elsewhere Fred Fargher was shaving his head for Lyric Theatre’s first production of The King and I, and Phil Hobson, one of National’s most popular actors was starring in Light Opera Company’s (BLOC) production of Kismet. Jenny Strickland’s production of Close Quarters opened the 1967 season, and this was described as a “thrilling whodunit”. This was followed by Alan Wakeling’s production of Mary, Mary. In August Don Fraser’s production of Gigi was presented and also entered in the Royal South Street Competitions, gaining third place. Victoria’s Premier Sir Henry Bolte and Lady Bolte accepted an invitation to be present at this production. Two more productions completed the season, the Australian drama The Shifting Heart and The Brides of March. During 1967 annual acting awards were inaugurated, sponsored by BTV6. The inaugural awards made for - best performances of the season, were shared by Geoff Tunbridge and Topsy Nevett, the protagonists in Close Quarters, and Maureen Christie for her role in The Shifting Heart. further five years, and improvements to the auditorium and foyer, including new carpet were completed. recorded. These were Matt Abson, a former president of the committee who had given a number of years of service to the theatre, and Bruce Jackson, committee member, Vice President and General Manager of BTV6. Thereafter the BTV6 acting awards were renamed the Bruce Jackson Memorial Awards, and in 1980 when the awards were recognised in the form of bronze statuettes, these were affectionately termed the “BJs”. Again, during the year several improvements were made to the theatre. studied. In August J B Priestley’s Dangerous Corner was produced, and the final production of the year was Marj Ford’s Pools Paradise. Fund-raising that year aided the purchase of a new dimming system, which was to prove a boon in the lighting of productions. 1972 saw an exciting opening to the theatre’s season in the world premiere of Hal Porter’s play Parker. Hal Porter had dedicated the play to Mrs Brenda Dowling, an active member of the theatre and committee member for many years. The gala opening night of Parker was under the patronage of the Premier Sir Henry Bolte and Lady Bolte and was held in the beautiful Ballarat Fine Art Gallery. Productions later in the year included a one-act play festival in April. Four plays were presented, giving the opportunity for four different directors to gain experience. The plays were The Incident, The Lesson, Barnstable and The Proposal. In June a comedy was presented, The Unsuspecting Bachelor written, directed and designed by Peter Nethercote. This was followed in September by Eugene O’Neill’s Long Days Journey into Night, which was another production of great interest to students of literary studies. The final production for 1972 was another light-hearted comedy Happy Days directed by Marj Ford. Maintenance and improvements to the theatre continued, with the purchase of new lamps, new speakers and other sound equipment, and major structural improvements were made to the back-stage and dressing room areas. implemented, and another National initiative – foyer exhibitions continued to delight patrons. In addition to the acting awards, the ‘BJs” this year a set design award was established and judged by Fred Fargher, who chose Laurence Cummin and Lowana Oliver as winners for their Hedda Gabler set. Under the presidency of Doug Sarah further improvements were made to the backstage and dressing rooms. The 1974 season opened with a drama directed by Jenny Strickland, Lady in Danger. This was followed in May be Joy Smith’s experimental production of Macbeth, again of great interest to students and audiences alike. In July Thelma Walker’s Sailor Beware played to packed houses, following which Ron Boon made a welcome return to National directing the black comedy The Anniversary. The final production for the year was Marj Ford’s production of Is Your Honeymoon Really Necessary? This production was booked out before it opened, and was so popular that it ran for an extended season. Improvements over the year included the remodelling of the box office which now contained a library of plays and poetry, further improvements to backstage, cataloguing the contents of the wardrobe and an updating of the sound and lighting systems. Charity nights continued to net recipients around $200 on opening nights; some productions even had two charity nights per season. Foyer exhibitions continued to be a highlight of front of house. 1975 opened with another World Premiere, Peter Nethercote’s musical Trifle. Under Peter’s direction, the production, which he had scored and designed, reportedly created “a minor sensation in Ballarat for its vitality and catchy music”. Trifle ran to full houses. Jenny Strickland’s production of the comedy The Amorous Prawn was also a sell-out and ran to an extended season. In October Joy Smith’s production of The Crucible again proved to be popular with students of the text. The final production for the season was another comedy from Marj Ford The Marriage Go Round. The BJ awards had now been augmented with a “Best Performance in a Supporting Role” donated by the Ballarat Arts Council; this was won by Lois Walter, while Peter Nethercote took out the award for Best Set Design. During the year a servery hatch was constructed between kitchen and foyer, to aid the serving of interval refreshments. Backstage, major earthworks had been undertaken in the area affectionately known as ‘the dungeon’ in the foundations of the building; this excavation extended the storage and set-building area significantly. full houses. The following production was by the contemporary American writer Neil Simon – Come Blow Your Horn. During the year, a new logo representing the classic tragi-comedy masks was designed to be used on all Ballarat National Theatre publicity material. Another comedy opened the 1977 season, A Bird in the Hand, directed by Marj Ford followed soon after by Jenny Strickland’s production of Don’t Just Lie There, Say Something. This play was also staged at Sovereign Hill. This was followed by Noel Coward’s play This Happy Breed. Another successful comedy followed – Chase Me Comrade. The 1978 season opened with the drama, set in a court room You, the Jury, and in June the drama Children of the Wolf was staged. September marked Doug Sarah’s directing debut, with his production of Billy Liar. A successful innovation during this production was a smorgasbord dinner in the foyer, held before the performance on final night. The December production was Move Over Mrs Markham directed by Marj Ford. In December, the committee regretfully took the decision to suspend its Green Room nights due to lack of support. March 1979 saw the production of the comedy My Three Angels directed by Jenny Strickland, and in June a season of one-act plays was staged by the Wendouree Arts Council. The plays presented were The Dear Departed, Fumed Oak and String Trio. Next came Doug Sarah’s production of Goodnight Mrs Puffin, followed by On the Bridge at Midnight directed by Ron Boon. Charity nights continued to be popular as fund-raising activities for community groups and it is noted in the Annual Report that “recipients have usually been able to clear amounts of up to $450”. As in other years, the Annual Awards Dinner was the highlight of the social calendar. This was the first year that the BJs, the handsome bronze statuettes depicting the actor taking a bow, were presented. Jenny Strickland’s production of Mountain Air took the 1980 season off to a good start, and as with all of Jenny’s productions, was well attended. June saw another first time director in Roger Lemke for his production of I do, I do. This was a delightful musical with a two-hander cast of Wendy Holgate and John Williams. Roger went on to great success in opera, both in Australia and overseas. The third production of the year was Ray Lawler’s The Summer of the Seventeenth Doll directed by Alan Wakeling. The final production for the season was Butterflies are Free by another director making his directing debut, Peter Adams. During the year donated antique furniture was restored and placed in the foyer for the comfort of patrons. This year the theatre’s Constitution allowed for the appointment of an Executive Officer. The role of Executive Officer was filled by Doug Sarah until 1984. The first play for 1981 marked the debut of Ray Riordan as director. The play was A Taste of Honey. This was followed in June by Jenny Debney’s production of Miss Adams will be Waiting; this was also Jenny’s first time as director. The final production for the year was Murder at Deem House, a “whodunit” by Sam Bates and directed by Alan Wakeling. Improvements to the theatre included new carpeting for the vestibule, a television monitor in the foyer for the benefit of latecomers, and the recovering of antique chairs for the foyer. Doug Sarah’s production of The Secretary Bird opened the 1982 season, to be followed by the comedy-drama The Killing of Sister George directed by Ray Riordan. Doug Sarah’s second production for the year was Joe Orton’s farce What the Butler Saw, and the final production for the year was Neil Simon’s The Good Doctor, which was based on the plays of Anton Chekhov. This production was directed by, Michael MacNeill, an experienced director from Geelong. An exciting venture for the year was the introduction of a $1000 writing award for a full-length play of two or three acts. A total of 44 entries were received from interstate and New Zealand as well as local entries. The winning entry was Now and Then by Leonard Radic, who granted National Theatre the option of producing the world premiere of the play. Domestic improvements for the year included new illuminated mirrors for the dressing rooms, new flooring, painting and general updating of the kitchen. The 1983 season opened with Robert Bolt’s A Man for all Seasons, directed by John Williams. Following this, Alan Ayckbourn’s play Confusions, was staged with joint direction by Sonja Kinnersly and Bill Horrocks. The third production for the year was A A Milne’s Toad of Toad Hall directed by Ray Riordan. This was an ambitious piece given most of the large cast were children, and the challenge was to transform the tiny stage into a piece of English countryside – a challenge which was met very ably in Ray Riordan’s design. The season closed with Oscar Wilde’s comedy of manners The Importance of being Earnest directed by Kenneth Hemmens. It was not known at the time but this was to be the final production in the Little Theatre. Little Theatre. In July of that year a successful production of Neil Simon’s Come Blow Your Horn was mounted at Sovereign Hill, with production by Doug Sarah. The next production, under the direction of Dennis Griffin was Noel Coward’s Blithe Spirit was also performed at Sovereign Hill. The final play for the season was Kenneth Hemmens’s production of Charley’s Aunt, which worked very well in an intimate and comfortable performance space (otherwise known as the student Common Room) at Aquinas College. During the year also a successful one-act play festival was staged at the School of Mines (SMB) auditorium. This festival was held for the purpose of providing experience for new directors. 1985 was a year of consolidation for BNT, because it was demonstrated that it was possible for stability to be maintained even without a theatre to call ‘home-base’. The first production for the year was an original work by Joy Weidersatz – Astonish Me. Production was by Paul Rose, and it was the first full-scale production to be staged at the new Wendouree Secondary College theatre. A Ghost on Tiptoe a comedy by Robert Morley and Rosemary Ann Sisson followed, and was directed by Elise Brown in her first major production as director. This was also staged at the Wendouree College performing space. The Reluctant Doctor by Moliere and directed by Karl Hatton was the final production for the year. This was also staged at the Aquinas College venue, an ideal setting for this 17th Century farce. Another one-act play festival was held, and again new directors were able to learn from a panel of experts. During the year the committee was able to offer training to actors and directors in the form of workshops run by professionals. In May, the committee were saddened to learn of the death of Thelma Walker, a member of the 1938 NTM committee, director and long-time supporter of the theatre. The first production for 1986 was Edward Albee’s Who’s Afraid of Virginia Woolf directed by John Williams, and staged at the SMB auditorium. This was followed by Macbeth produced at the Gay Gough Theatre at the Mount Clear Secondary College. Again, students of the text took the opportunity of seeing the work produced live, and hundreds of secondary school students attended. In September Neil Simon’s comic fable Fools was presented to capacity audiences at the Wendouree Secondary College theatre, and Gavin Watt won the award for Best Set Design for his clever and inventive use of the space. The production was directed by Sonja Kinnersly. The final production for the year was Accommodations directed by Stephen Butler, and again staged at Aquinas College. Early in 1986 a Directors’ Summer School was held over five days. This was made possible through the financial assistance of the state government Ministry of the Arts. The workshop was conducted by Richard Hayes-Marshall, an internationally-trained actor, director and teacher. Later in the year a weekend voice production workshop was conducted by Rona McLeod, a Melbourne actress and teacher at the National Theatre Drama School. In that year two new awards were added to the BJs – for Best Director sponsored by BNT, and an additional Supporting Role award, donated by Wendouree Arts Council. 1987 was a quiet year, production-wise. In April Ira Levin’s psycho-drama Veronica’s Room under the direction of Elise Brown was staged at the Ballarat East High School. The following production was cancelled due to illness. However, the committee were kept busy planning future productions and workshops, and most importantly, following up leads to potential new premises. In August, Richard Hayes-Marshall conducted the second of his workshops for BNT, again with the financial support of the state government. This took the form of intensive exploration of characterisation, with reference to the traditional stock characters of the Commedia dell’arte. The result of these workshops was a production, Mixed Doubles which was presented as theatre restaurant. The combination of comedy plus dinner proved to be very popular with patrons. Direction was by Sonja Kinnersly. Plans for 1988 centred around the 50th Anniversary of Ballarat National Theatre in March. Included in the celebration planned were a dinner dance with Geoff Richards as guest speaker; Geoff was an Honorary Life Member and a member of the inaugural 1938 committee. My history of National Theatre – Ballarat National Theatre, Fifty Golden Years was launched and other souvenirs included a commemorative calendar featuring wonderful photographs of past productions on each month (the earliest being the 1940 production Mr Pim Passes By) and a photographic montage as wall poster. In my 1988 publication a section was included which contained memories of several of Ballarat National Theatre members who had been a significant part of the Theatre’s 50-year history. Memories and anecdotes (painful and funny) were supplied by, Bob Baker, Peter Barwood, Albert Dulfer, Ian Field, Marj Ford, John Fox, Gordon Henderson, Philip Hobson, Peter James, Geoff Richards, Connie Russo, Doug Sarah, Val Sarah, Joy Smith, Jenny Strickland, Alan Wakeling, and Thelma Walker. Sadly, some have now passed away, but their enormous contribution to the emerging live theatre in Ballarat has helped to shape today’s Ballarat National Theatre, an enduring and still vital part of Ballarat’s theatre world, which continues to fulfil Gertrude Johnson’s vision of 1938 – “...to produce the best possible entertainment at moderate prices”. My sincere congratulations to Ballarat National Theatre on a “job well done” in attaining its 75th Anniversary. I think I speak for all members and audiences over the years in wishing BNT good fortune in the coming years, and keenly anticipate the Theatre’s Centenary celebrations in 2038.